Will autumn prove to be the spring selling season that passed the boating industry by? Judging from September sales in early-reporting states, the mild fall that extended the summer in many areas was encouraging some consumers to buy now and not wait until 2014. Sales for the month in the main powerboat segments rose 18.3 percent, or 729, to 4,705, from September 2012 and industrywide sales rose 19.9 percent, or 1,239, to 7,472, in 25 states that represent 59 percent of the national market, according to data compiled by Statistical Surveys. September marked the third month in a row of double-digit percentage growth in both categories as builders and dealers rebounded from the effects of a cold, wet spring. The data raised hopes that the industry could have a second successive year of overall sales gains as it continues its recovery from the Great Recession. Florida was the September leader with 1,449 sales, 280 more than the state reported in 2012. Texas ranked second at 1,171, followed by North Carolina (582), California (515) and Michigan (458). Rounding out the top 10 were South Carolina (380), Tennessee (336), Georgia (329), Mississippi (279) and New York (216). Kloppe said all of the top 10-selling states and 21 of the 25 that have reported say they had more September sales this year than they did in 2012. “That’s big,” he said. With the other 25 yet to report, the industry is likely to surpass its 50-state total from last September, when 9,412 boats were sold. Sales traditionally slow as the year winds down, so Kloppe doubts that fall sales can overcome the effects of the weak spring even if the gains continue. For the year through September in the early-reporting states, sales were up 4.7 percent in the main segments, or 5,009 boats, to 110,808, and they were up 1 percent industrywide, or 1,740, to 173,902. 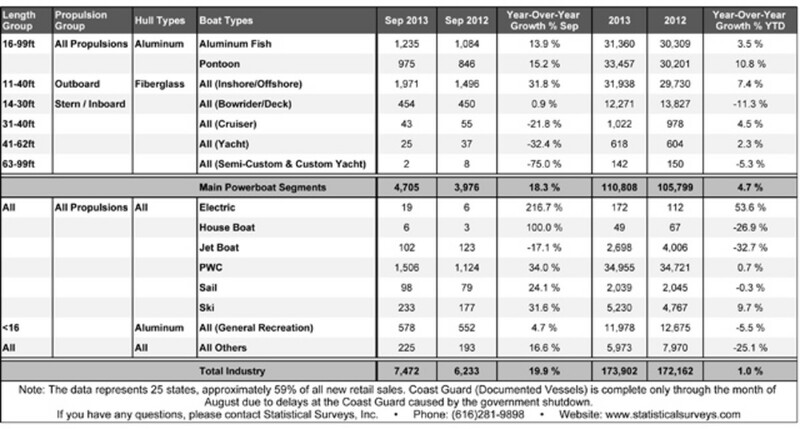 Sales of 11- to 40-foot outboard fiberglass boats rose 31.8 percent, or 475 boats, to 1,971 in September, sales of aluminum fishing boats climbed by 13.9 percent, or 151, to 1,235, and sales of aluminum pontoon boats increased 15.2 percent, or 129, to 975. The three segments have been the industry’s sales leaders for more than a year. Even 14- to 30-foot inboard and sterndrive boats, a category that has lagged, eked out a four-boat sales gain to 454. Bigger-boat categories appeared to falter during the month. Sales of 31-to 40-foot cruisers fell by 12, to 43, sales of 41- to 62-foot yachts dropped by the same amount, to 25, and there were only two sales of 63-to 99-foot yachts, compared with eight in September a year earlier. However, Coast Guard data on documented vessels were complete only through August because of the partial federal government shutdown. That creates an incomplete report for boats larger than 31 feet and understates the cruiser and yacht markets. Sales of personal watercraft rose 34 percent, or 382 units, to 1,506. PWC had the highest percentage gain among the industry’s high-volume categories. Ski-boat sales fared nearly as well, rising 31.6 percent, or 56 boats, to 233. Jetboats continued to lag as sales fell by 21 to 102. The category has felt the loss of Sea-Doo, which withdrew from the market, but it is expected to rebound once builders that plan to compete there start to introduce their boats. Sailboat sales rose by 19 to 98.